Stress free tutoring. Results you’ll love. Can you really improve your SAT score by a large amount? It’s a controversial question. The answer is yes, but let me state the other side first. It seems that last year’s controversy about SAT Score Improvement has reared it’s head again. A widely distributed AP story once again insinuates that it’s not really possible for a student to significantly raise his SAT score. I don’t dispute that most kids don’t significantly raise their scores. What I dispute is the insinuation that most kids can’t. Most students can raise their score about 300 points from their baseline PSAT score; some students can raise it much higher than that. So why does the test prep industry fail so often? Because while many people can “teach”, very few can help students learn. Take a moment to let that sink in. It’s a big claim. And it’s not only true in test prep, by the way. It’s true in all of education. Anyone who’s ever been in a classroom knows that it’s one thing to be able to “teach” material, and a whole other thing to be able to help people to learn it. That’s the difference between the “outer game” of education, and the “inner game”. In the world of SAT prep, the outer game is understanding the material on the test and the test taking techniques, and improving your critical thinking skills. The inner game is all about believing in yourself, maintaining your focus, staying positive rather than getting discouraged while you study and prepare, and eliminating anxiety while taking the test. The inner game is where the huge score increases come from. Most tutors can’t help you with it. They might understand the material and the test taking techniques, but they don’t understand their students. If you have big goals and you’re highly motivated to reach them, go ahead and contact me. Chances are I can help you to achieve them. I have to honestly say that I don’t know the answer to this question. I know that the College Board is worried about cheating, so I’m not completely surprised by the situation you describe. However, as someone taking the test and honestly working to improve your score, you shouldn’t worry about that happening. Just work hard and do your best. And good luck with everything! Quick question! I heard the other day that regardless of getting a higher mark if you take the test again, it is frowned upon by prestigious schools to take it twice. Should I just take it once? Thanks for writing, I’m glad to have a chance to clear this up. Most people take the SAT twice, some people even take it three times. The universities all know this, even the most prestigious ones, and it’s totally OK.
Good luck with it, and let me know how it goes! Hi. I took SAT and got a score of 1320. Well I wasnt feeling too great on test day. I skipped many questions. However one day before the actual test day, I got a score of 1550. I am planning to take it again after 8 months. Is there a chance that I could get a score of 2100 if I work very hard? Also I am concerned about college boards suspicion of cheating? Score increases like that are rare, but not impossible. Keep working at it. I commend you for your desire and your high goals. Don’t worry about whether the college board will suspect cheating. Feel free to write back with more specific questions as they come up. Thanks for replying.Well now I am planning to give it again in June. I have been practising really hard for past month. My maths score from 480 (on real sat) raised to 640 (on practise tests according to the latest) And I am sure that it will increase till I give it again in June! But what bothers me is that about the cheating which college board could accuse if I improved way too much on SAT. I am giving SAT (2nd attempt) from India (new country). Will it matter much? That’s great that your score is going up so much. Keep practicing and I’m sure it will keep improving! I don’t know anything about what causes the College Board to accuse someone of cheating and, if they do, what if anything you can do about it. I do know this. It’s entirely out of your control. That means you should consciously release any concern or worry about it that you may have. You’re only job is to work hard and do the best you can. Improve as much as you can and trust that everything will work out for the best. I have great respect for you, and everyone, who puts their mind to this and decides to go for their goals. Let me know if I can help you with that. I’m currently a sophmore who took the SAT and got a 2140. Do SAT scores naturally improve with time? Can I get 2200+ in my junior year? Also, I have a lot of trouble with writing (I got a 650) and I was wondering if you had any suggestions to help me raise my writing score? Thanks! Great job with at 2140, especially as a sophomore. Your SAT scores will probably naturally improve with time because you got your score early in your sophomore year. By the spring of your junior year you’ll likely have learned a lot more and also matured academically, which often results in a higher SAT score even if you don’t put in extraordinary effort. For everyone who’s reading this as a junior, you shouldn’t expect that your score will naturally go up between the spring of your junior year and the fall of your senior year unless you work hard at it. Raising your Writing score is bigger matter than I can fit in a blog post, but if you send me an email to jeff@satsuccesssecrets.com I can give you more help. Good luck with everything! You’re doing great! You help is greatly appreciated. Most kids won’t get a 600 point increase in their scores. However, a couple of years ago someone wrote to me asking if he could raise his score 500 points with only a week to go before the test. I told him that it wasn’t possible, and a month or so later he wrote back to tell me that he reached his goal. Basically he told me that I was wrong to doubt him. Now, I have no idea if he was telling the truth, but the most important lesson that I took from this was to never to tell a student that something is not possible. When you practice and get a question wrong, you have to be able to figure out why you got it wrong, and then work to correct it. Sometimes you need someone else to help you, and sometimes you can go it on your own. There’s a lot of great information on this site that can help you go a long way towards your goal. I wish you good luck with it! I am going to take the in October and I am freaking out. I need to have a combined score of at least 1340 on CR and Math in order to get into the program I want to be in for college. The last time I took the SAT I got a 570 in CR and 580 in Math. My overall SAT score was 1700 but I need to boost that up. I have the Official SAT Study Guide Book and another prep book from Barron’s. Which one should I study out of? Is there any way I could improve on vocabulary with the time I have? Are the flashcards from Barron’s helpful at all? What type of study schedule should I maintain? Is it bad to be taking the SAT a third time and do colleges frown upon that? I am sorry for asking so many questions but I really need to get into the program and I am willing to do anything to reach my goal. The 100 point improvement you need in each section is not easy to do on your own, but not impossible, either. You should definitely use the Official SAT Study Guide, by the College Board (who makes the SAT), because it shows you exactly what the questions are like on the test. Books from the other companies, like Barrons, Kaplan, etc., just aren’t good enough. However, their flashcards are good, and you definitely have time to improve your vocabulary in the 8 weeks before the test. Set the goal of learning 25 new words each week, and it will make a noticeable difference in your Critical Reading score. There’s no problem taking the SAT a third time. A lot of kids do it, and the colleges don’t hold it against you. For the next 2 months, studying for the SAT is more important than your schoolwork, because it has a greater impact on your chances of getting accepted than any homework assignment or any one test. You can catch up on that stuff after the SAT is over. 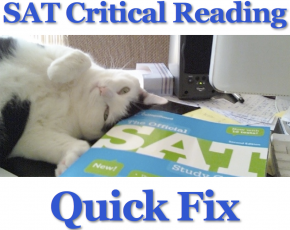 An exact study schedule is too detailed to go into here, but consider getting my SAT Quick Fix Study Guide, where I go into that in great depth. Here’s the link of you want to check it out. Hi, I took SAT only once and scored 1580 with no preparation. I wanted to have a feeling of the test. I would like to know how much I can improve on with a rigorous preparation for next 3 months. I have read that not more than 40 points could be improved no matter what and if I improve a lot the College board may hold my score suspecting cheating. It’s good to get a feeling of the test and to see what you can score without any preparation. It’s been my experience that most people who prepare rigorously for 3 months can improve their score by 300 points. That doesn’t mean that everybody will. You have to be able to figure out why what you’re having trouble with and why. You have to be able to tell why they right answers are right and and why yours are wrong and to have an idea of what you have to do to improve. And you have to have a sense of how the test works, because timing and pacing and making good educated guesses are an important part of that process. As far as what makes the College Board suspect cheating, I’m not an expert on that. I do know that it’s not just a big score increase. You just have to work hard at improving and do as well as you can. That’s the only part you can control. Check Out This Free Online Course! Can SAT Prep Really Help? Should You Hire a Tutor?